Browse Signing Savvy on Android! We are happy to report that, in addition to all of your favorite Apple iOS devices, Signing Savvy should now work with your Android devices (Android OS 2.2 or newer with Flash support)! Just fire up the web browser on your Android device and give it a try. We just got it working so let us know if you are experiencing any troubles. The "gmail.com" portion of my email address was found to have repeated a few times after I had entered my password and logged in on a couple of failed trys, but otherwise great! I have been waiting for Android function and I am delighted. I just made a trip to Best Buy to check out the new iPad 2. It is very slick! The line was too long to get one today (it just launched at 5pm), but I did fire up the Safari browser on the display model to check out Signing Savvy. The site looks great on this shiny new mobile device. Soooo glad to see this! Thank you !!! If you have Android 2.2 or newer and video is not displaying, you may need to go to the Android Marketplace and download the Flash plugin. Creating Word Lists and Sharing Word Lists, when combined with Flash Cards and Quizzing, are our most popular full member features. Today, we added a minor enhancement to creating word lists and a new shared word list of our own. You can now create word lists that sort the word list by the date the words were added to the word list. This is in addition to the previous options of alphabetically or custom ordered word lists. When you view your word lists that are sorted by date, the word list will show the date each word was added to the word list. 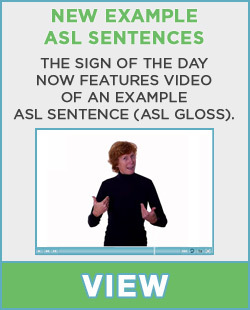 This may come in handy, for example, if you are teaching (or taking) a sign language class and you want your word list to reflect WHEN the words (signs) were introduced. What was the Sign of the Day yesterday? Part of the reason we added the new word list ordering option is so we could add a Sign of the Day word list. This new shared word list shows all of the signs of the day since the Signing Savvy site launched. This is a feature that a number of you have asked for. We are happy to be able to make it available to full members. This is one shared word list that you may want to bookmark.